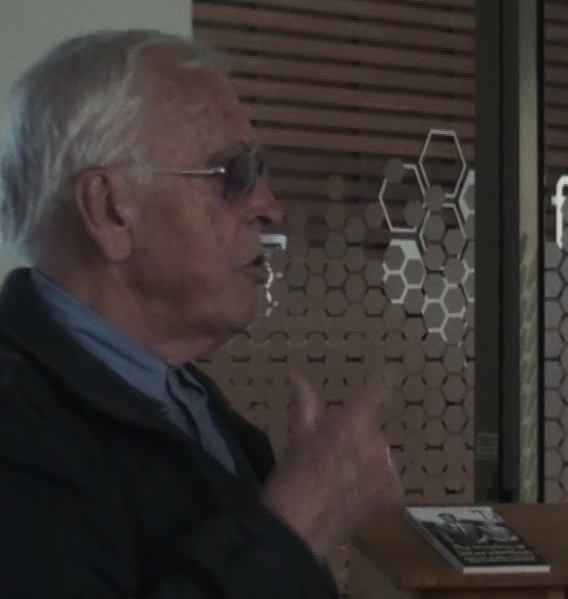 Australian Catholic Bishop, Hilton Deakin, launched Greg Poulgrain’s new research The Incubus of Intervention: Conflicting Indonesia strategies of John F. Kennedy and Allen Dulles at the Federal Republic of West Papua office in Docklands on 3 May 2015. 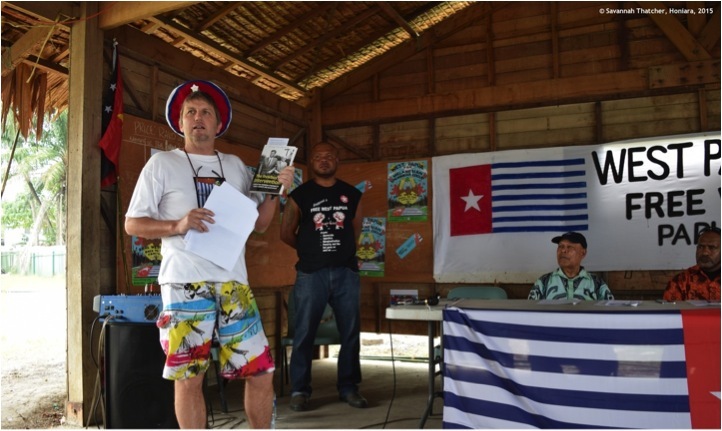 Bishop Deakin, who is well known for his support of East Timor’s liberation from Indonesia, re-launched the book in Trades Hall on 15 May 2015 where the Australian trade union movement had assembled to sign a Memorandum of Understanding with the Federal Republic of West Papua. 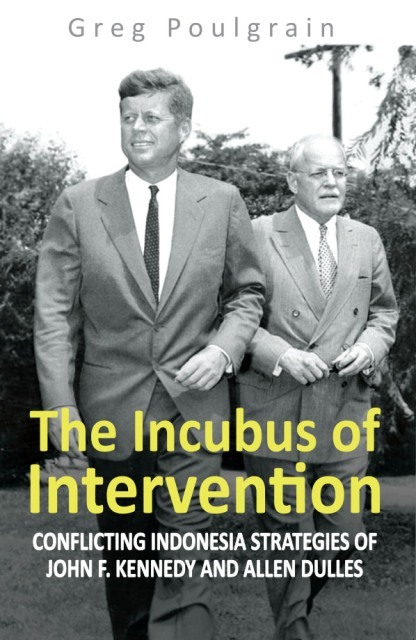 The Incubus of Intervention is published by the Strategic Information and Research Centre (Malaysia) in January 2015, and can be bought online here. The distributor in Australia is the New International Bookshop (Trades Hall, 54 Victoria St, Carlton, Melbourne, 3053: Tel 03-9662 3744). “This book is a very dense text. You look up the sources of information that Greg Poulgrain has used over many years, and you’ll see just how this man has tried to put this thing together and make sense of it. Not only is it dense, but it’s disturbing. And I think when you get hold of a book that should disturb you, it’s worth reading. JACKET TEXT Sukarno was at the centre of the conflict between John F. Kennedy and Allen Dulles (Director of Central Intelligence). With the intention of removing Sukarno from power, Dulles’ strategy of ‘regime change’ was well-advanced before Kennedy became president. Indeed, his intelligence-career started before Kennedy was born. In 1958 DCI Dulles was at the height of his power. He was not simply targeting the Outer Islands in Indonesia, but the entire Indonesian archipelago, including Netherlands New Guinea where the world’s largest gold deposit was located (and is today still being mined). Unlike Dulles, neither Kennedy nor Sukarno was aware of this El Dorado. But when the author interviewd Joseph Luns, the former Dutch Foreign Minister who became NATO Secretary-General, Luns said that he had asked the Americans involved to exploit the huge gold deposit jointly with the Dutch. It was their refusal, Luns said, that actually forced the Dutch out of New Guinea. When Kennedy and Sukarno resolved to work together, US foreign policy threatened to disrupt Dulles own Cold War strategy, which was then focused on Indonesia. JFK’s wariness, after Dulles’ role in the Bay of Pigs, drew his tongue-in-cheek but prophetic comment that ‘Domestic policy can only defeat us, but foreign policy can kills us’. Thirty years of research underpins Greg Poulgrain’s claim that Allen Dulles (CIA Director 1952-1961) arranged for the death of Dag Hammarskjöld, thus precluding the UN Secretary-General from presenting his OPEX Program for West Papua to the General Assembly. OPEX would have de-commissioned both Indonesia’s and The Netherlands’ claims of sovereignty, and instituted West Papua as a UN Trust Territory, wherein UN administrative officers would assist an independent Papuan government for five years. 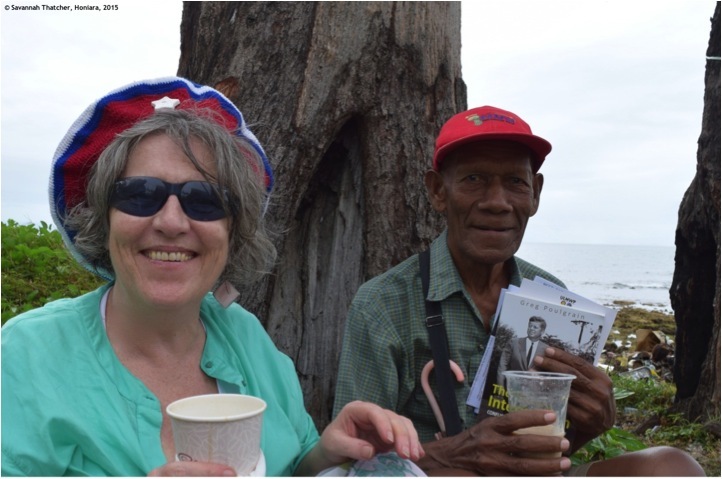 Poulgrain believes “Hammarskjöld’s formula would have changed history, principally because it recognized Papuan sovereignty over Papuan land”. Within weeks of his research being published in 2015, the UN announced a review of circumstances surrounding the aeroplane crash in 1961 that killed Hammarskjöld.